Asbjørn Sunde was one of Norway’s most important saboteur leaders during World War 2. He and several of his collaborate had fought during the Spanish Civil War. During the summer of 1941, he started his first operation. Sunde and his men destroyed industry and infrastructure of importance to the Nazi war effort with cunning and precise methods. Soon Sunde was feared by the Nazis. With Gestapo at his heels and against orders from the Norwegian Exile government, he pushed his people to their limit with a courage few regular saboteur groups could muster. 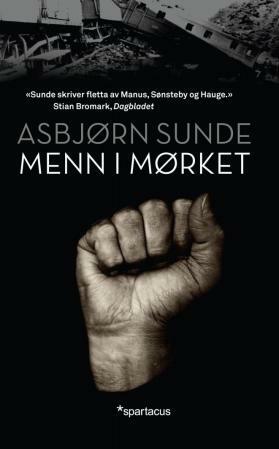 Sunde and his men were the resistance group in Norway who risked the most and lost most people. Few of them were honored after the war, most of them were persecuted as communists. Reading Men In the Dark is like reading a real-life action novel you don’t believe to be true, except it was. This book starts out with a pang and there is action from the first page. I was surprised that the books throw you into the action that early, but I suppose that was how it really was. I cannot imagine living and constantly have to look over your shoulder or watch your back due to having Gestapo at your heels. To constantly be afraid for your family, friends, and being discovered. It must have been hell from April 9, 1940, to May 8, 1945. Writing-wise it is a bit jumpy from time to time, but it wasn’t too bothersome. I suppose it is this way because it is partly based on personal notes and memoirs. Character-wise Sunde seems a bit curt to me. From the story, it shows that this obviously worked for him as a leader. His group, the Osvald group, was very successful during the war even though they had their fair share of personnel casualties. The book focuses mainly on the activities of the saboteur group and not as much on Sunde as a person. We get glimpses of his thoughts and feelings, but it is hard to determine how he really was, at least I had a hard time understanding him. Maybe it’s because I’m from a different generation? What I can say for sure is that he was willing to die for his country and its freedom. He went against the orders of Norway’s excite government in London in order to succeed in the missions of the group. The book gives a clear and up-close picture of how the Osvald Group lived, functioned and survived under the Nazi-regime in Norway. What I find truly unfair is the way Sunde and his men were treated after the war. Due to their political beliefs, it seemed like their sacrifice wasn’t as great as the other saboteur groups. After the war, a picture was painted of the group that gave the impression that they hadn’t been a part of the resistance at all. The Osvald group weren’t mentioned in the great books written about the war in the 60s, 70s, and 80s. If they were mentioned they were mentioned in a scathing and ridicule kind of way. I think that is horrible, but I assume that due to the Cold War people weren’t too friendly towards people who believed in the communist cause. It’s not an excuse, but it might be an explanation. Sunde’s story has become more known over the years, and I believe, and hope, that people view the Osvald group differently now than previously. Most of the members are gone, but we can remember their memories and be grateful for their sacrifices. Men in the Dark gives perspective to the Norwegian resistance cause during the war. They all fought for the same goal, but some seemed to be more valuable than others. I think this is an important book to read for everybody who is interested in the Norwegian resistance story during World War 2. Thank you Spartacus Forlag for sending me this copy!